In a town known for glitz and glamour Aspen Meadows Resort, a Dolce Hotels and Resorts property, is a bit of an anomaly. The Bauhaus-inspired buildings are notable for their stark simplicity and striking minimalism. Most of the retreat was designed (and built) by Bauhaus architect Herbert Bayer between 1953 and 1973. 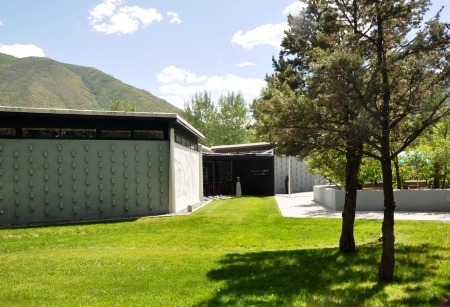 Originally dorms for the prestigious Aspen Institute, located on the same 40-acre property, these mid-century buildings were turned into a luxury resort in 1992. The clean, classically geometric lines stand in sharp contrast to the lush lawns and quivering aspen trees. The Rocky Mountains stand sentinel in the background, affording spectacular views. 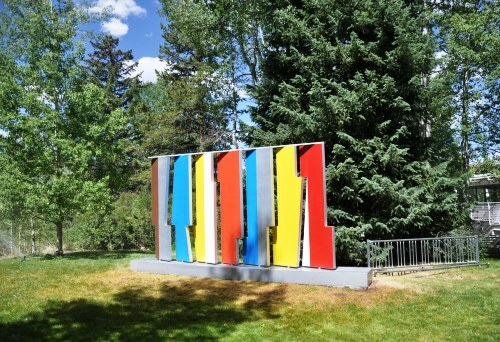 Abstract sculptures dot the lawns reminding visitors of the resort’s strong connection to art and simplicity. Aspen Meadows, an all suite resort, has earned Forbes’ Four Star designation. The design and furnishings echo the Bauhaus philosophy of clean lines and functionality, using design to unite mind, body and spirit. In their eyes, nature was the unifying element bringing the trio together. All the resort’s contemporary buildings are either white or a color called “Bayer Blue,” named after the architect. It was the color of the façade of Aspen’s historic Hotel Jerome at the time the buildings were designed. Each of Aspen Meadow’s 98 guest suites is spacious, offering between 650 to 1,200 square feet of living space. Accommodation types range from Junior Suites to One and Two Bedroom and Deluxe Suites. All feature ingeniously conceived floor to ceiling windows designed to bring the outside in. During the day, these glass walls bring the beauty of nature into the suite. In the evening, draw the shades for privacy. Opaque panels at the bottoms allow the crisp mountain air in while keeping passing eyes out. Suites echo the Bauhaus principles, with simple furnishings and minimalist décor. Suites have Wi-Fi and are comfortably set up for people who need to work while there. In addition, there are three business centers offering computers, printers and fax service for guests’ convenience. The Resort offers three dining options. 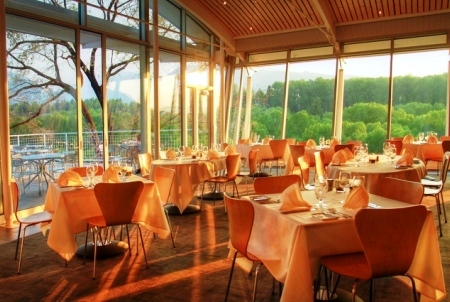 The Meadows Restaurant, offering mountain views serves breakfast and lunch. The Hefner Lounge serves drinks and a bar menu 11 am until 11pm daily. Dinner is served nightly in the intimate Plato’s. The dining room is stunning. The Bauhaus design includes floor to ceiling windows offering panoramic 180 degree views. The philosophy behind the seasonally changing menu is sustainability. Food sourced from local farmers and producers when possible and some is even grown right in the restaurants backyard. A healthy body was one of the tenants of the Bauhaus philosophy and is an important part of Aspen Meadows Resort. The Health Center, opened in 1957, offers fitness equipment, a saline swimming and six tennis courts. The US Ski Team trained here in the 1960s and 70s and local athletes still use the facilities. Sign out one of the complimentary bikes for guests and ride around the grounds or the local area. Walking is one of the best ways to get exercise. Walk at your own pace through the glorious grounds and beyond. The natural beauty enhanced by well-placed gardens and water features and sculptures make walking a true pleasure for the senses. The concierge and front desk staff can arrange seasonal off-site activities such as hiking, white-water rafting, fly fishing, horseback riding, ballooning, snowshoeing, cross-country skiing and more. American industrialist, Walter Paepcke and his wife, Elizabeth, started Aspen Institute, a world-class think tank, in 1949. The idea behind it was to unite mind, body and spirit. They hired Bauhaus architect, Herbert Bayer to execute their vision. It’s attracted some of the greatest minds of the time 20th and 21st centuries including Albert Schweitzer, Oprah Winfrey, Bill and Hilary Clinton, Condoleezza Rice, President Obama, the Dali Lama, Karl Rove, Biz Stone, Sandra Day O’Connor, James Cameron and more. It’s an eclectic list of who’s who from around the world. Their website says it perfectly. The Institute attracts people from all political persuasions. When the Institute’s original building needed renovation, it was financed by David Koch of the Koch Brothers and bears his name. In 2007, the prestigious TED Talk was held here. There’s even an original Buckminster Fuller dome. Now covered, it can be rented for weddings, conferences or other events. The Institute now has year round headquarters in Washington, DC. Founded in 1951, as part of the Paepcke’s vision, the Aspen Music Festival and School brings musical protégés and early professionals together with master teachers for eight weeks of learning and performances. Concerts in the Benedict Music Tent are a highlight of Aspen’s summer season. You can buy a ticket and sit inside or listen for free on the adjacent lawn. 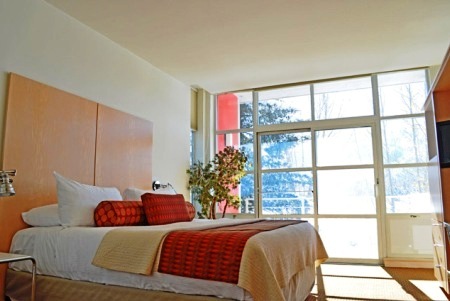 Aspen Meadows Resort offers guests a welcoming cocoon from the pressures of the outside world. 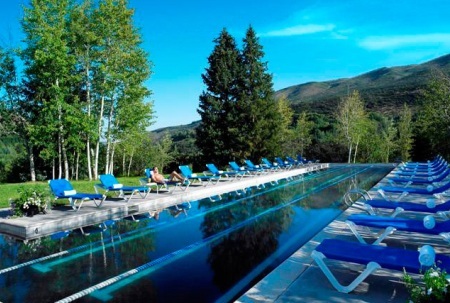 Guests who want to be part of Aspen’s sophisticated scene can easily access it. The magnet for the chic and trendy is a mere four minutes away via hotel shuttle. Not many places combine peace, solitude and Rocky Mountain views with the amenities of a Four Star property and access to a chic town. Aspen Meadows Resort does it all. 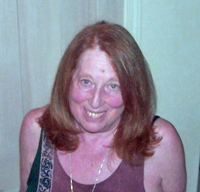 Author’s note: We were guests of Aspen Meadows Resort. Their generous hospitality did not affect this article in any way.